As a basic principle, le-tex generates precisely the PDF data you need for your application from the various typesetting programs. 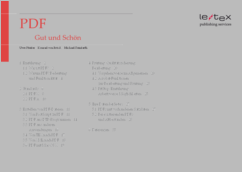 This means le-tex is able to generate Unicode-coded PDF output in every typesetting system in order to save texts in searchable format in, for example, the phonetic, Phoenician, or classical Greek alphabets. Tagging of PDFs is very important for accessible documents, but cannot readily be generated from the standard typesetting systems. le-tex has the experience needed to generate tagged output in line with PDF/A-1 from TeX, Word, and InDesign workflows. le-tex can also process existing PDF data to ensure optimum usability for different applications (print, online, mobile etc.). le-tex has experience of various preflight workflows and also offers consulting in this field. When converting from PDF typesetting data to reflowable e-books (generally: To XML), it is necessary to extrapolate the structure and semantics of the text from information such as font size and spacing. A spellcheck of the converted data supports quality assurance.